Bill Slavin wrote: I haven't used Photobucket but my Picassa account became unwieldly so I've switched to copying images from my (still free) blog with Blogger. If I want to share pictures but don't want them posted on the blog I drop them into an unpublished blog post (called Photo Dump) and copy from there. If you want, you never even have it have a published blog. All the rest occasionally hold the Service closed for a while, depending on how many pics you´ve got or how many times they are viewed and then ask you to upgrade to the next Level. Believe me, thier asking you to upgrade never Ends. Google accounts ie; Blogger, are (at the Moment) free and with one or two tricks* can hold 1000´s of photos. ..Example, My blog holds 5000 at the Moment, without tricks to expand the free space. *which aren´t necessary for a couple of thousand pics. This is indeed bad news as your pictures of Ligny are inspirational and cannot be lost. If you have the pictures it would be relatively easy to set up a blog and also free. I transfer my pictures off my blog to this forum without trouble and I note they haven't been deleted. If you had your own blog this would have the added advantage of putting everything in one place but wouldn't stop you posting here too. Many thanks again to Paul for his help. I am reposting the last set of pictures and intend to work on the rest with hopefully a new photo provider due to the extortionate demands of Photobucket. I hope to have something more original as the battle draws to its close in the near future. We can always rely on you for some dramatic scenes and interesting pyrotechnics Mr Dodson. I was just wondering if you were related to a certain Mr M Bentine. Thank you very much and please, it's Chris. Christopher brings back memories of being naughty. Talking of which no I am not related but I do remember Mr Bentines potty time. His Battle of Waterloo was completely bonkers. Your photos are awesome. I feel transported into the scenery. Very impressive! Like always a pleasure and a delight of historical narration! Will we see again the formerly photos which disappeared? I am currently working on the next episode but have all the original photos despite Photobuckets extortion racket. It is my intention to re post them but whilst I could use the PB fix I am of the opinion that a more reliable provider would be a better option first. Thank you again to everyone for their kind wishes. Two years. It has flown by. 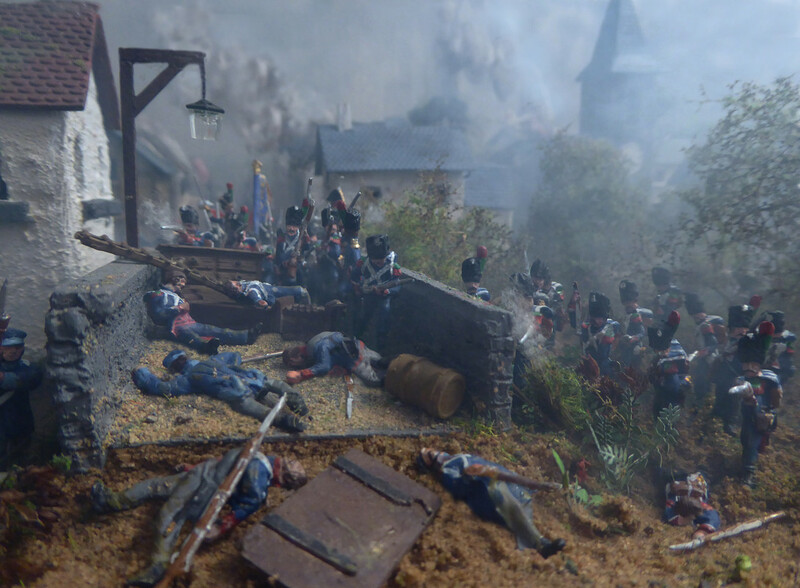 Chasseurs and Grenadiers of the Imperial Guard have siezed the stone bridge by the watermill and are fighting towards the Bois du Loop. 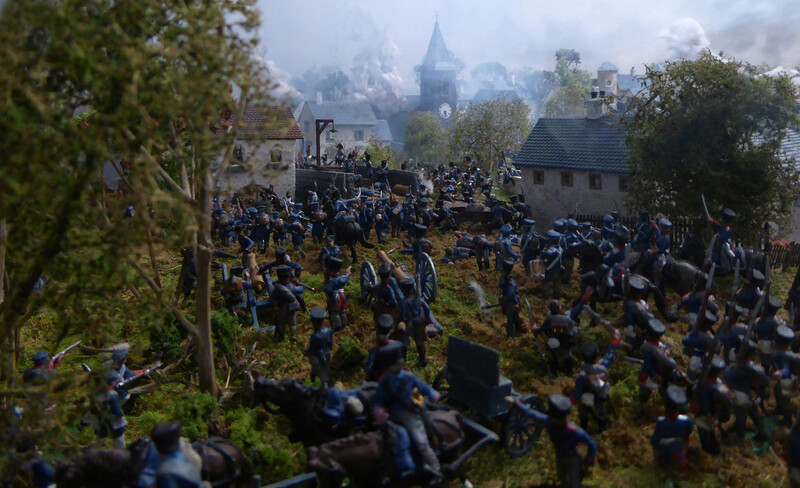 To the west of Ligny more units of the Guard are emerging from village as Prussian resiatance collapses. 2nd Brigade De La Jeune Garde, Marechal-de-camp Guye supported by 7th Infantry Division, Lieutenant-general Baron Jean-Baptiste Girard are simultaneously advancing on Brye. 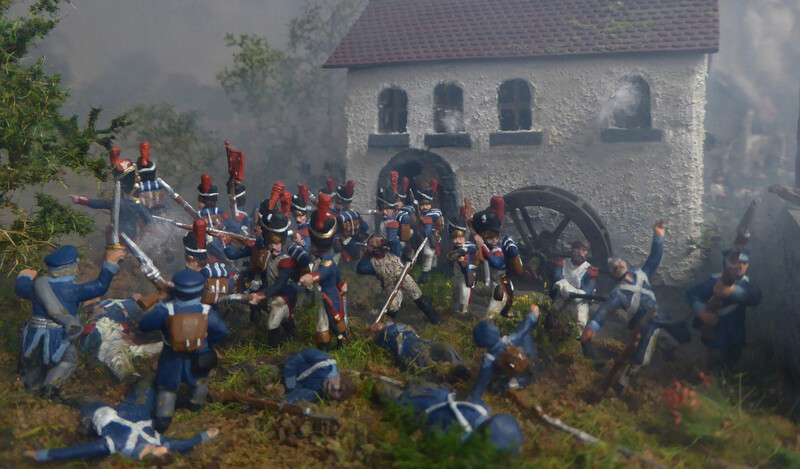 Elements of the Prussian 6th Brigade, Generalmajor Karl August von Kraftare are fighting a spirited rearguard action at the Ferme du Moulin in order to prevent the remains of the Prussian defence being outflanked. The thunderstorm has moved on and the light returns for the final act. Only nightfall can save the Prussians from total defeat but Blucher is undeterred. Vowats, Angriff, fur der Vaterland miene kinder! Last edited by Paul on 27 Apr 2018, 15:26, edited 1 time in total. Apologies, Thomas has pointed out my poor spelling. To be honest I hate predictive text and stubby fingers do not help! Vorwärts, Angriff, für das Vaterland meine Kinder! 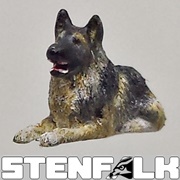 I have a suspicion that you're not a modeller Chris. I think you have a time machine in the attic. This is absolutely fantastic, Chris, I can only dream of achieving this kind of quality. You should be in the film industry...maybe you are! You let us participate as an invulnerably away fan. To move with the attack or to be a first line soldier who face the attack to hold the line. See the wounded, see the blood, see the death of your comrade who was just right beside you. Whooping screams, horror screams, the smell of gun smoke. For the flag! The play with dust, light effects, shadows, angle of the camera, background of the pic as a mix of close ups and then a full line of soldier. You use it with intense like Blüchers attack. Mass fighting scenes inside and outside the houses and the battle in the landscape. So there is no highlight of a single protagonist. This all together let us know that there is violent action everywhere. 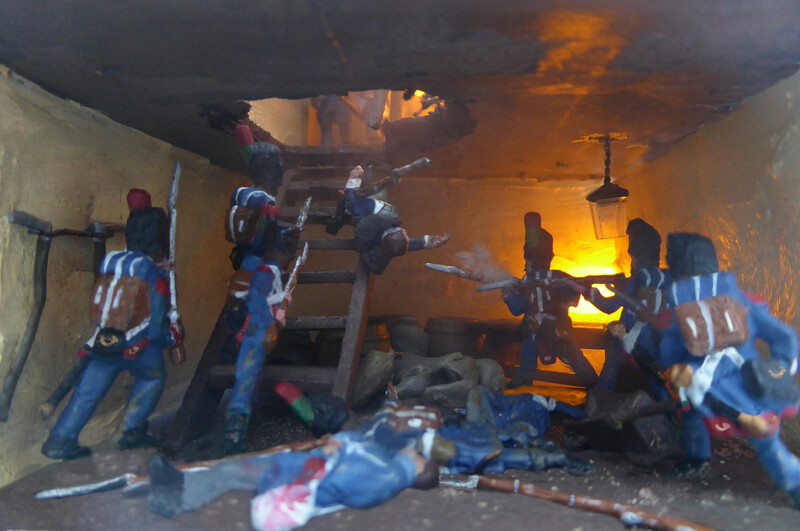 Several figures are converted in pose to fit in the scene. And you take care that all fallen soldier touch completely the ground. 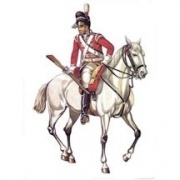 As the horses are chosen to run or to tow a gun slow. A logical composition beginning by the poor, bravely, fighting, tiny soldier up to the moving lines into the city of the whole battlefield. You are really a great story-teller! How many details! How many stories in the story! And which impressive interactions! Thank you all for your kind comments and again, apologies for the missing R's in Vorwarts. To be honest I think I was getting a bit excited when Postimage worked and forgot to check the spelling! Unfortunately I do not have a time machine but the clip from the H G Wells film brings back memories. I also remember ' The Time Tunnel' which kept malfunctioning. I have no film training other than teaching myself. My friend Thomas Mischak did send me a link about film special effects which was informative. To see the models for Ben Hur etc gets you thinking. With respect to the project I have learnt an enormous amount since I started and my Gettysburg pictures from years ago look really silly in comparison. Nevertheless, I feel that there is room for improvement and I appreciate members suggestions and input. A good idea is always a good idea. 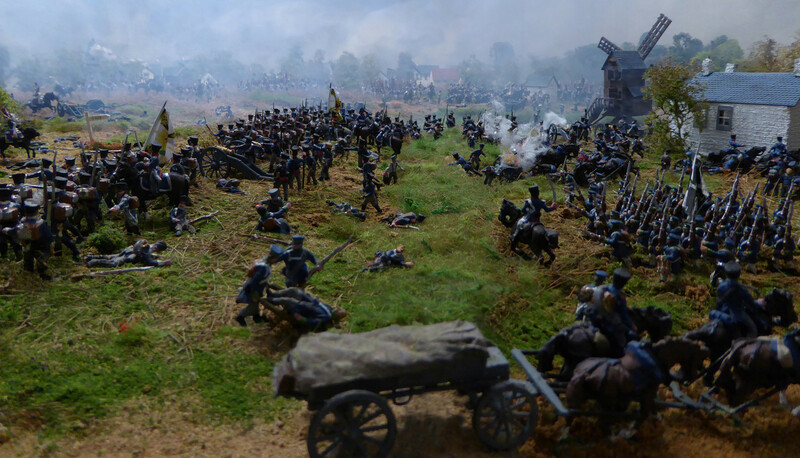 I am currently working on the closing stages of Ligny and also the troops, buildings etc for Quatre Bras. This is one of the best movies I've seen in years! Very good work and as the other says, you really let us come close to the action! Some great action scenes again, with lots of smoke and explosions all well done. Fantastic and inspiring, wish more people made bigger projects like this though I know from experience how difficult it is to get space for it. C M Dodson wrote: Photobucket is history.